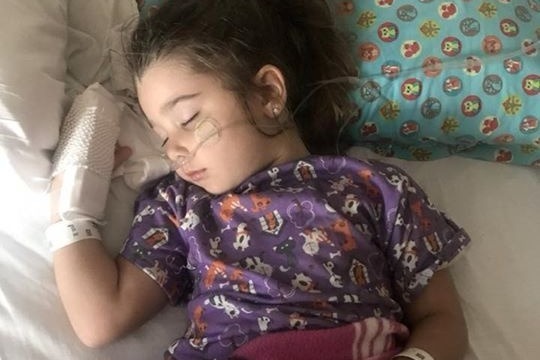 Little 4 year old Elianna was diagnosed with Chemical Pneumonitis, Aspiration Pneumonia and Perihilar Edema after a freak accident in her grandparent's pool. My name is Courtney and I work with Elianna's Mom at a small business in Bradenton, Florida. My coworkers and I have a set up an GoFundMe for the extensive amount of hospital bills Elianna's Family will receive after this unfortunate accident. Elianna has since been release from the hospital and is continuing her treatment at home. Any donation will be more than appreciated. "I contemplated whether or not this was worth posting, and at the end of the day, I am where I am because of something another Dad posted sometime last year. If I can even help save one child, this is worth it for me. I kept replaying that pool scene in my head and remembered reading a story last year about a Dad in Texas whose son passed away because he went untreated after swallowing a bunch of pool water. I wasn’t going to let that be Elianna. If your child swallows/inhales a bunch of water, and something seems off AT ALL, I encourage you to immediately get help. I wonder if I would have taken her Monday, would she be better off?? And I wonder if I waited longer what would have happened. It’s so scary. For now, we just pray that the antibiotic takes quickly and her lungs can find a way to get rid of the pool chemicals. They will keep us until she’s fever free for 24 hours, her chest X-ray comes back clear, and she can sleep fully through the night without her oxygen levels dropping so drastically. If she requires more than 3 liters of oxygen we will be transferred to Hopkins All Children’s Hospital. We don’t know how long the road will be but I thank my lucky stars that I read that article of the little boy. I will find that article and write that Dad a letter, I promise you. I would have never taken her to the urgent care without that and God only knows how this would have ended."